Part of the Sheikh Zayed Institute's mission is to build a culture of innovation in pediatric medicine around the world. 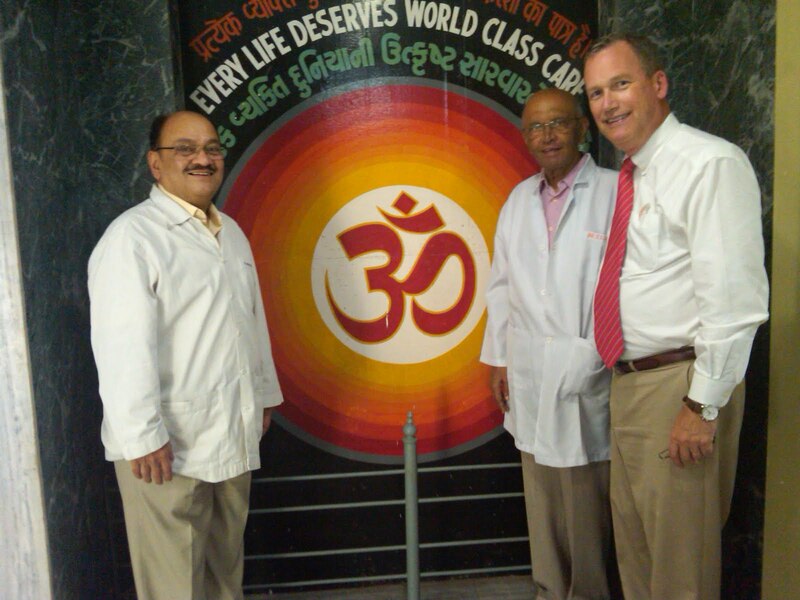 Recently, the Institute's Craig Peters, MD, an internationally known pediatric robotic surgeon, traveled to India to share the techniques of pediatric urological robotic surgery with doctors in several cities. Acting as faculty of the Pediatric Urology course sponsored by the Jayamdas Patel academic Centre of the Muljibhai Patel Urological Hospital in Nadiad, India, Dr. Peters performed several reconstructive laparoscopic surgeries in children and gave six lectures, all with the aim of fostering pediatric urology education, best practices, and international collaboration. 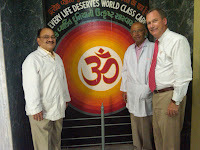 Dr. Peters then spent three days in Delhi at the Medanta Medical City, where he performed several pediatric robotic surgeries, lectured, and gave case conferences as part of a visit to the Vattikuti Foundation for Robotic and Minimally Invasive Surgery. 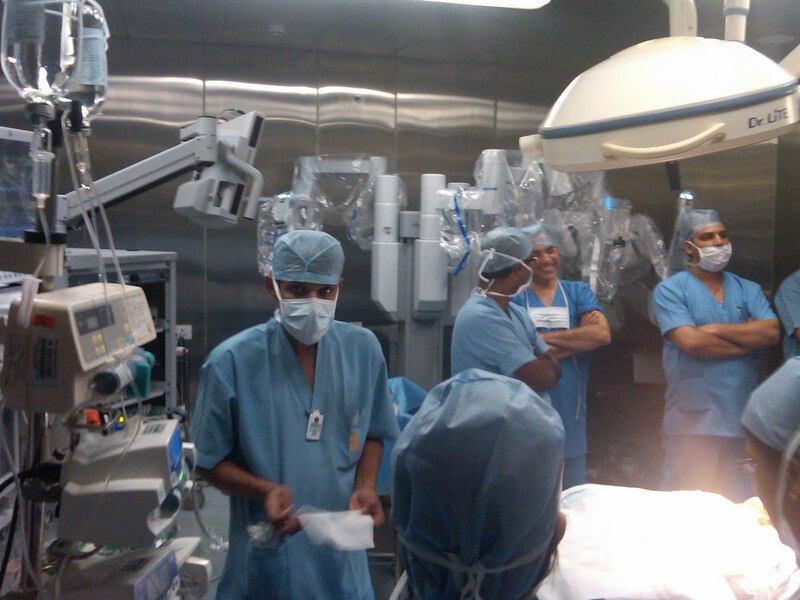 Dr. Peters' procedures were some of the first pediatric robotic surgical cases performed in the entire country, and were performed on younger children than ever before in India. This trip also included a two-day visit and a few robotic surgeries in Bengaluru (Bangalore) at the Manipal Hospital, also as part of the Vattikuti Foundation. Like his t ime in Delhi, the visit to Bengalaru aimed to build educational programs for pediatric urology, pediatric robotics, and other types of minimally invasive surgery, as well as grow research collaborations in new technologies for pediatric surgery in the region and with the Sheikh Zayed Institute in Washington, DC. These continued collaborations, educational opportunities, and the introduction of these groundbreaking procedures in India and other countries around the world will ultimately improve pediatric surgical care for all children. The Board of Directors at Children’s National Medical Center announced today that Kurt Newman, MD has been named President and Chief Executive Officer, effective September 1, 2011. Dr. Newman has been at Children’s National for more than 25 years and currently serves as the Senior Vice President for the Center for Surgical Care and the Sheikh Zayed Institute for Pediatric Surgical Innovation. 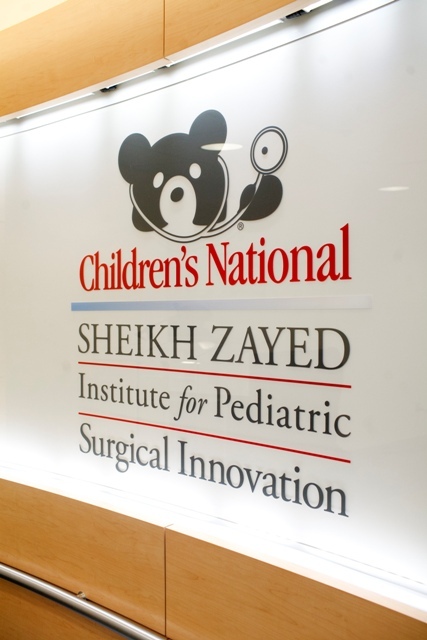 Researchers, biomedical engineers, and clinicians from the Sheikh Zayed Institute for Pediatric Surgical Innovation have moved into new state-of-the-art collaborative research space at Children’s National Medical Center. The new 22,000-square-foot institute is located on the top floor of Children’s National, at the Sheikh Zayed Campus for Advanced Children’s Medicine. An “Institute without Walls,” the floor plan breaks down traditional research silos by creating open concept, modular areas that can adapt to changing priorities and allow research teams to easily connect with their neighbors. Key features include easy pass-throughs from traditional wet labs to bioengineering spaces, research offices, and meeting rooms, walls of glass instead of plaster, and curved whiteboard Innovation Walls at key gathering places to foster the sharing of ideas. We spent some time with Uri Yokel and Heather Johnson of Louviere, Stratton, & Yokel, LLC, chief designers of our new Sheikh Zayed Institute space. LSY specializes in the design of research laboratories. Collaboration: the overlap of different disciplines all in one area brings the kind of discovery that you don’t get if you’re in your own little space. The scientists were 100 percent behind us. We presented several concepts to the group, and everybody gravitated to the one that fostered the most interaction. 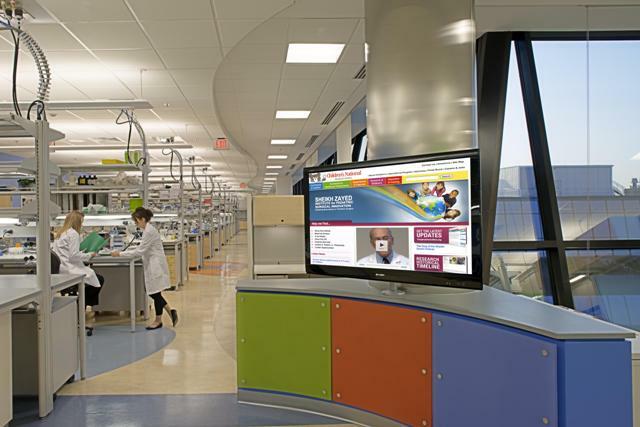 Sustainability: every part of this lab is sustainable, from floor to ceiling. Children’s made a commitment to this from the beginning. It’s very hard to do in a lab space–usually labs are inefficient because of safety requirements. Representing the Institute’s mission: the home of the institute should convey the spirit of discovery as well as the generosity of its benefactors. Think of the “entry sequence”: as you approach the space, you are greeted first by the graphic logo, then you turn and see the colorful high tech serpentine wall that leads you right by a portal into the big lab, so you get a view of actual science as you’re headed to the director’s suite. We think it helps the institute convey the discovery image along the way. Reduced overall energy consumption—20 to 30 percent lower than a normal lab. Flexibility: we designed a case work system where benches are not connected to the floor, i.e., any bench can be totally removed. We can remove them without even having to get a contractor involved. Benches can also be raised and lowered and cabinets are on wheels to increase flexibility. The bioengineering lab design is completely unique: we included flexibility to allow power/data to come in through the floor. The ceiling is structural ceiling to allow for equipment to hang—it can support a maximum concentrated load of 621 lbs. static, and 38 lbs. per sq. ft. dynamic. Just as a comparison, a standard panel ceiling supports approximately 3 to 4 lbs per square foot. What were some of the challenges you faced on this project? Children’s National has an established standard color palette. It was an interesting and welcome challenge to represent this palette (geared towards children and families) in a sophisticated way. The shape of the space was another welcome challenge. If you look at the blueprint, it’s not a rectangle—it’s shaped like an airplane. These “renovation” designs are a fun challenge—you have to work with the existing space rather than just creating a new building from scratch. Finally, the timeline was challenging. Usually a lab of this size and scope takes six months to design and 10 months to build. Design started around November/December, construction started April/May 2010. It was completed in March 2011. Children’s construction team, led by Lee Barton, was instrumental in making the expedited timeline happen. The challenge of addressing technical/safety issues (air flow, etc.) and also making it an enjoyable space for people to work in. We enjoy working with researchers: they pick up concepts quickly and are interested in innovation, so as clients they’re great. Can you give us some examples of other projects you’ve worked on recently? We work with various universities including the University of Pittsburgh, George Mason, and Virginia Tech. We also do some work for the NIH and the FDA. NIH also engages LSY as peer reviewers for labs nationally and internationally, which gives us firsthand views of cutting edge work in lab design. How is lab design different from other forms of space planning/design? Technical issues/requirements. Besides safety, there is a lot of very highly sophisticated equipment that requires a special environment. If you look at the drawing of a lab vs. the drawing of an office, you’d be surprised at the difference—there many more notes, and many more details in lab design to handle the complexity, which is what makes it so interesting to us. Anything else you’d like to add? Just that we are so appreciative that Children’s put their trust in us on this project. Hopefully we satisfied and delighted them with the end result. Read more about the new space. 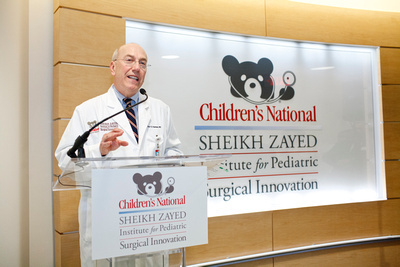 eikh Zayed Institute for Pediatric Surgical Innovation. This year marked the first year of participation for the Sheikh Zayed Institute, and the first year that pediatric surgical challenges and innovations were a primary topic of discussion. ge this opportunity to explore the pediatric topics discussed at CARS,” said Dr. Cleary. “It was great to gain exposure to the cutting edge of surgical innovation,” said Dr. Davenport of her visit to CARS.